Unlike ShoreTel's all-in-one, all-IP solution, the Avaya platforms have been adapted from legacy technology and assembled piecemeal. The result is a complex solution that can require extensive time and resources to manage. By contrast, the ShoreTel Unified Communications system was designed from the ground up expressly for IP to provide a single, all-in-one solution that integrates a full range of communications capabilities. 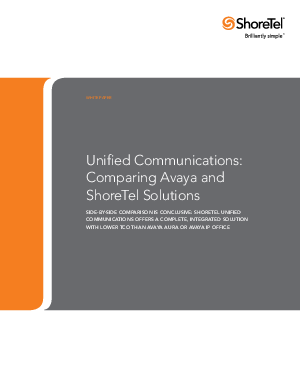 The paper also demonstrates that ShoreTel UC offers numerous advantages that enable businesses to capitalize on the benefits of unified communications without adding costs or complexity.